How much does it cost to take the CPA program in Canada? You want to be a chartered professional accountant. How much will it cost? VANCOUVER, November 26, 2018 – How much does it cost to become a chartered professional accountant? Or, to be more specific, how much does it cost to take the CPA professional education program in Canada? A lot of people who want to be CPAs don’t know how much CPA PEP will cost or how long it takes. The provincial accounting bodies don’t do a great job of explaining the big picture. Instead they break down the cost by course and you’re left trying to piece it all together. Andrew Knapman, student in the CPA professional education program. 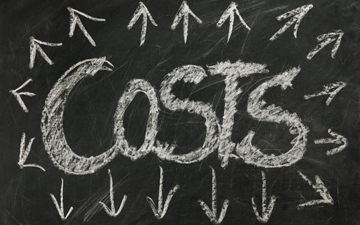 Costs are based on the 2018/19 CPA Western School of Business (CPAWSB) fee schedule. Costs in other regions will differ, albeit slightly, so check your region’s fees. You are starting with zero credits and have to do every PREP and PEP course. You work full-time while studying for the entirety of the program. You pass every module on the first attempt. You do not take any breaks between studying, other than breaks that are enforced due to CPA scheduling. You do not incur any fees other than the course fees, the membership dues and initial registration fees, all of which are mandatory. Having gone through the program and written the Common Final Examination (CFE), I think I’ve got a pretty good grasp of how much it costs to become a CPA. Many students in the program don’t know, for example, that taking the CFE is not free — it currently costs $1500 — or that there are three mandatory continuing professional development courses at the end of the process, each at a current cost of $275. For PREP, the order of modules taken is much more flexible than PEP, so you can move these around as you please (most courses have pre-requisites of some sort though; for example, you can’t take advanced financial reporting before intermediate). Since the assumption is that you are working full-time, all core modules should be taken in isolation as these demand 20+ hours of study per week. As such, I do not recommend taking more than one core module at a time if working full-time, but you could feasibly take two non-core modules (as I’ve assumed) or one core module and one non-core module if you are really trying to speed up the process. All-in, if you have to do PREP from scratch with no credits to begin, you’re looking at three years of study and around $10,500. Your PEP journey could have started in semester four of year three, but since Capstone 1 is only offered in semester two, you have to take a two-semester break at some point, so I separated these at the beginning and end of PEP’s core/elective modules. Note that this enforced break would be wiped out completely if you began studying PREP in semester three of year one, finished it by semester one of year four, moved straight into PEP by semester two (year four) and finally began Capstone 1 in semester two of year five. It all depends on your timing. Again, to save time, you could technically study the core/elective modules simultaneously (known as fast tracking), but if you are working full-time this would be almost impossible. Assuming you don’t fast track, PEP is going to take another two years or so and, due to the large increase in course/membership fees, this is actually going to cost a little more than PREP, at just under $12,500. Before you can become a CPA you are required to also take three professional development courses, usually after you have sat the CFE. You can take these before getting your CFE mark though, usually in semester four, which is also when the CFE results are given out. 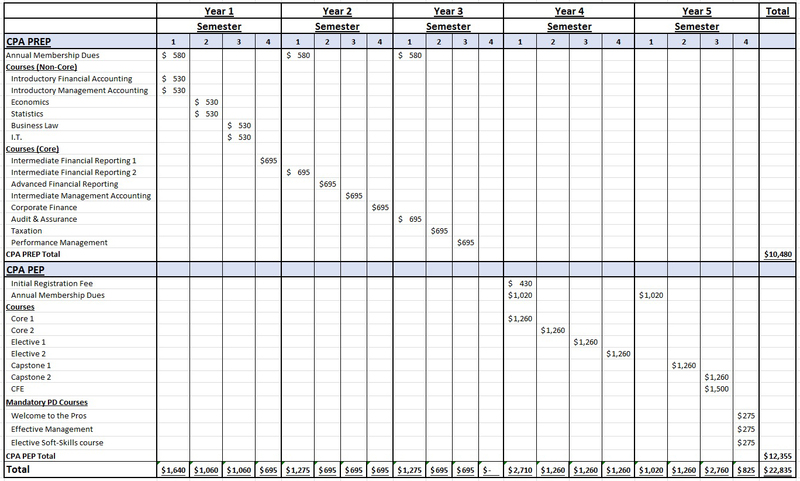 Based on the assumptions made, the full CPA PREP and PEP journey is going to take just under five years and cost around $23,000. This is pretty accurate with my experience, having started PREP in January 2013 and sitting the CFE in September 2018. If you’re only doing PEP, it’ll be at least two years and cost $12,500. I am not sure if this will discourage you. I hope not. But at least you have all the information now to make an informed decision as to whether or not to start this journey. The good news is, once you are a CPA, the payback period should be short, potentially just a couple of years. Being a CPA vs. a non-CPA can result in a significant difference in income for the remainder of your working career. I will conclude with this. I’ve been a student in the CPA program for five years now and I honestly have no idea where the time went. Now that I am near the finishing line, I am definitely glad I started the journey and stuck with it, and I look forward to where the CPA designation will take me in my career for the next few decades. Note: The table does not consider the time taken to obtain the necessary work experience to become a CPA. This equates to 2.5 years of relevant experience, which is longer than PEP takes. As such, students that go straight into PEP usually require more time and thus more membership dues to become a CPA. Due to the fact I went through PREP first, I accumulated all the necessary experience before finishing the CFE. Should accounting students buy CPA PEP third-party courses and materials?